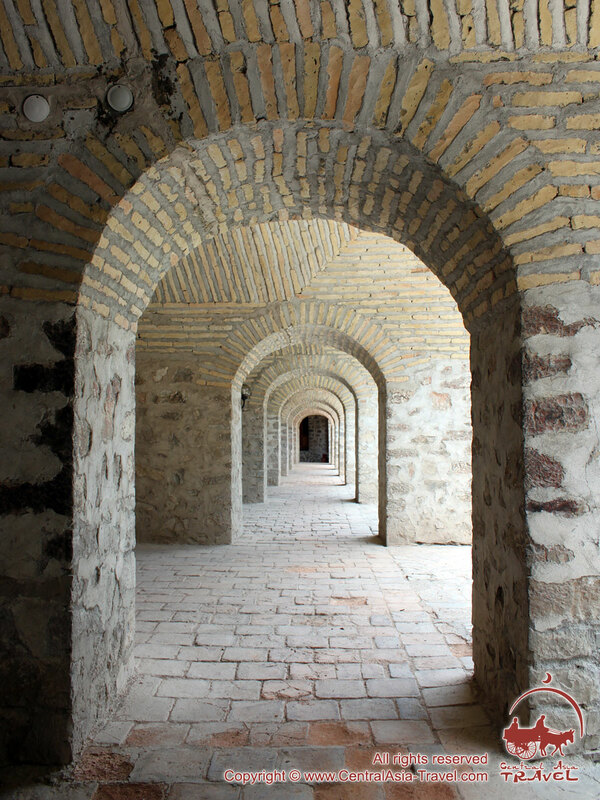 Azerbaijan is a very remarkable country, boasting unique history and traditions. The numerous trade routes of the Great Silk Road used to intersect the country in the old times. 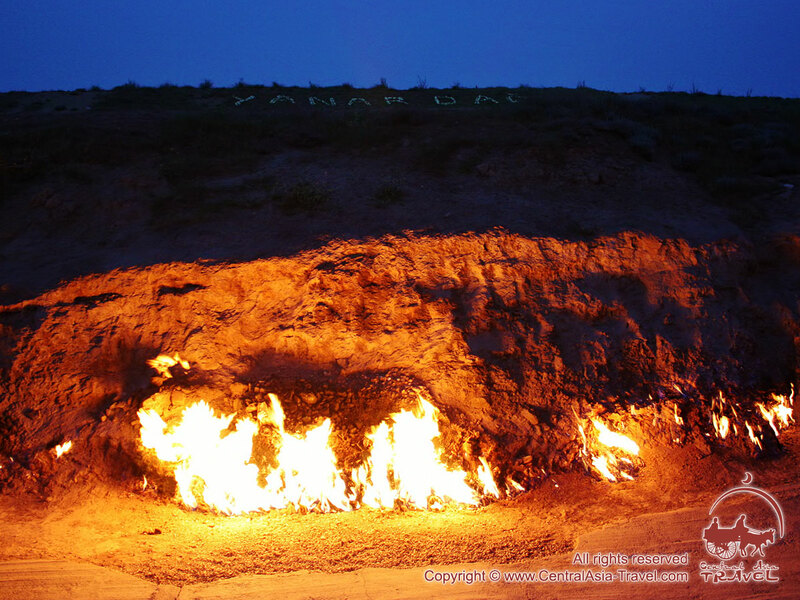 Azerbaijan is often called ‘the country of fires’, as rich oil and gas deposits lying close to the surface throughout the country, when kindled, used to form gigantic burning columns growing right from the ground and to impress greatly the ancient fire-worshipping tribes inhabiting the territory. 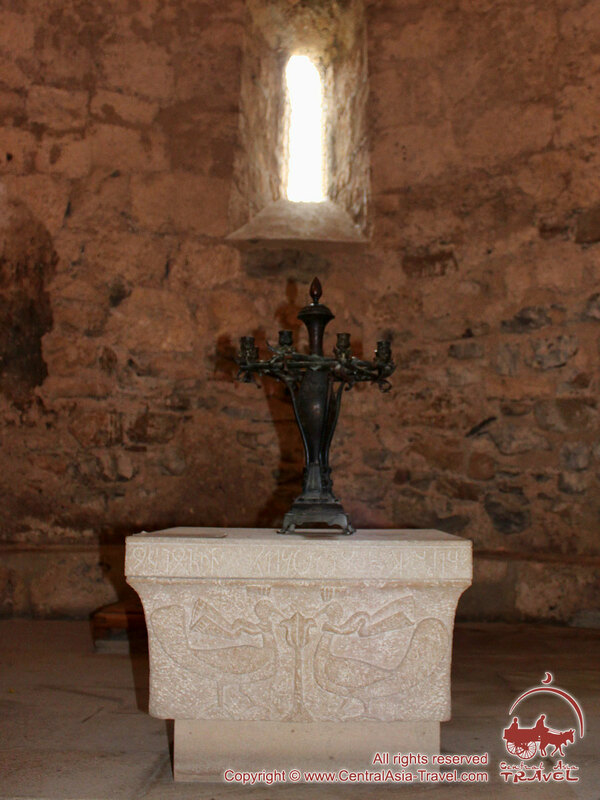 Those times were commemorated in numerous temples and rock paintings. 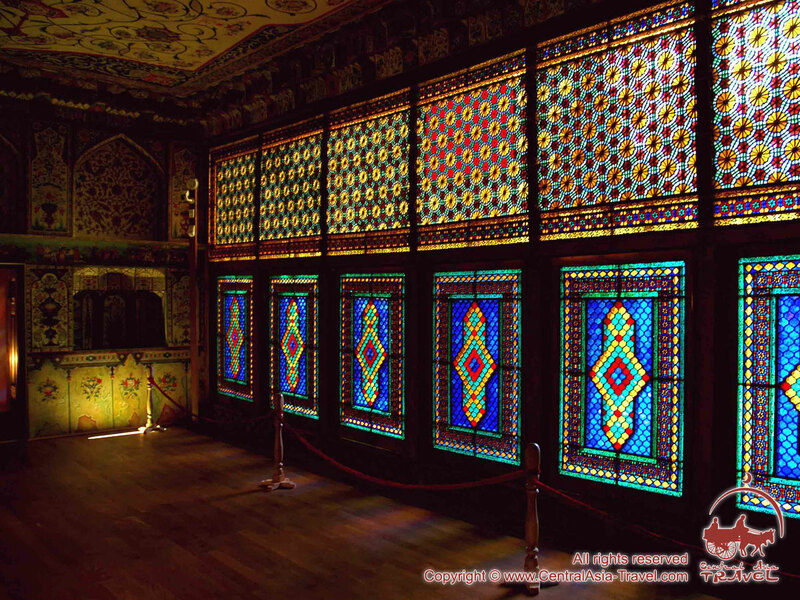 A holiday in Azerbaijan will turn out an incredibly peasant and diverse time span, during which you will see a number of impressive historical monuments, travel to majestic mountains, walk on the quay of Baku, visit Shamakhi and Sheki, bathe in the mild sun on the shore of the Caspian Sea, contemplate the capital’s modern architecture and partake of the sweetest fruit and traditional food. ‘The Trip to the Country of Fires’ tour of Azerbaijan includes all the country’s key attractions that any visitor must see: the Mountain Park, Old City, Heydar Aliyev Centre, Magomayev Philharmonic Hall, Maiden Tower, Palace of the Shirvanshahs, Gobustan National Park and many others. Day 1. Arrival in Baku. Nighttime excursion. Arrival in Baku. Meeting at airport. Transfer to and accommodation in hotel. Free time. 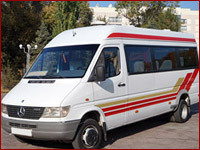 Nighttime excursion at 8.00 p.m., including the Mountain Park, Baku Boulevard, Nizami Street and the Fountains Square. Return to hotel. Overnight at the hotel. 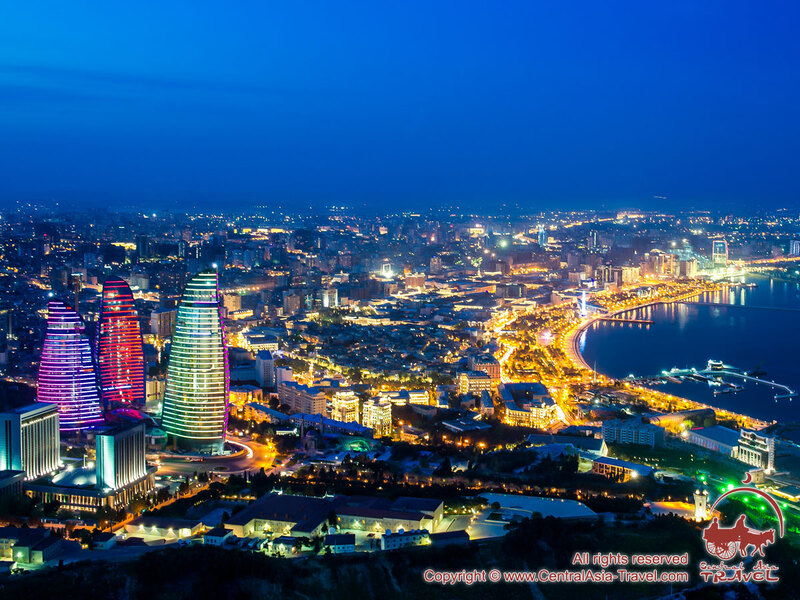 Welcome to the capital of Azerbaijan, Baku, one of the most rapidly developing Eurasian cities and the largest city in the Caucasus with a population of around 2.2 million people. 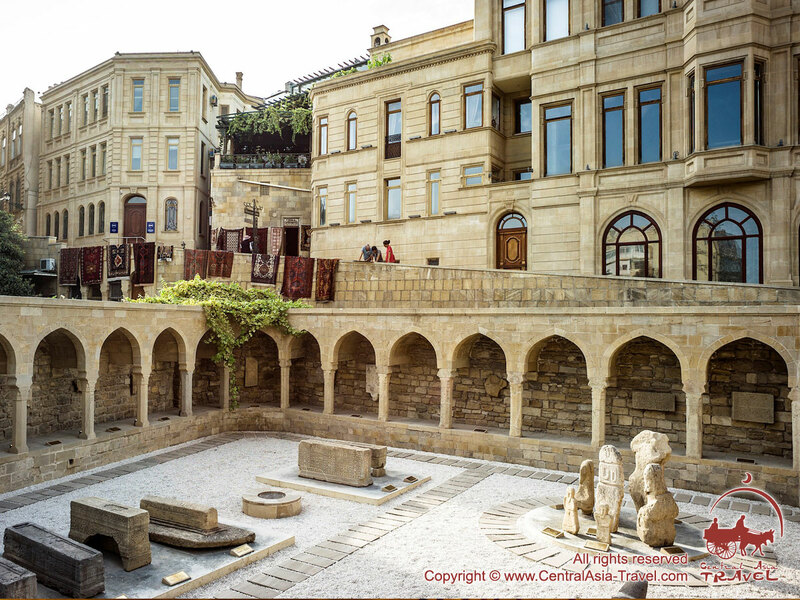 A very beautiful historic place, Baku is also an artistic and cultural centre, with fast growing industrial and commercial sectors at that. 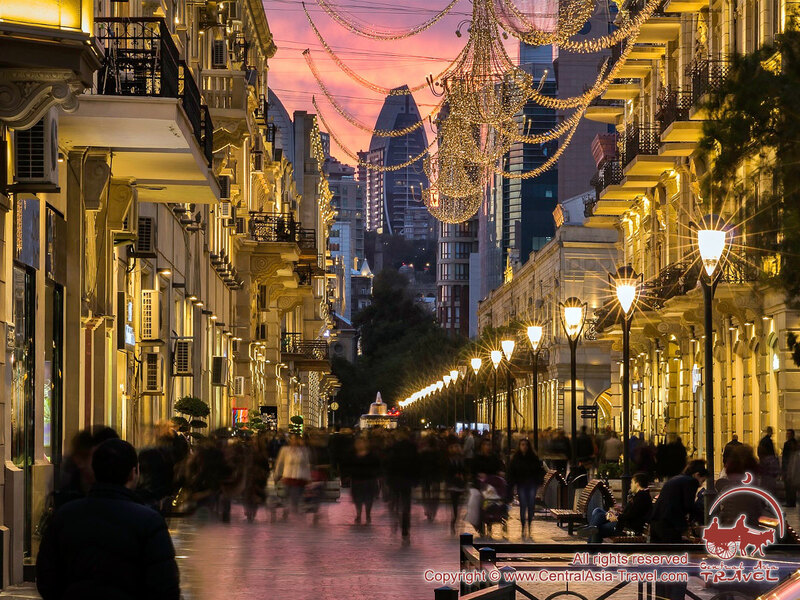 Your first acquaintance with Baku’s unique and wonderful places of interestwill be in unusual circumstances: you will see them wrapped in darkness and mysteriously illuminated with artificial light. 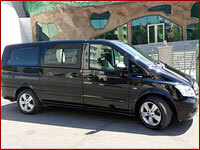 The excursion to Baku will start from the Mountain Park, the city’s highest point. From there you can obtain an amazing bird’s-eye view of the city and the bay. 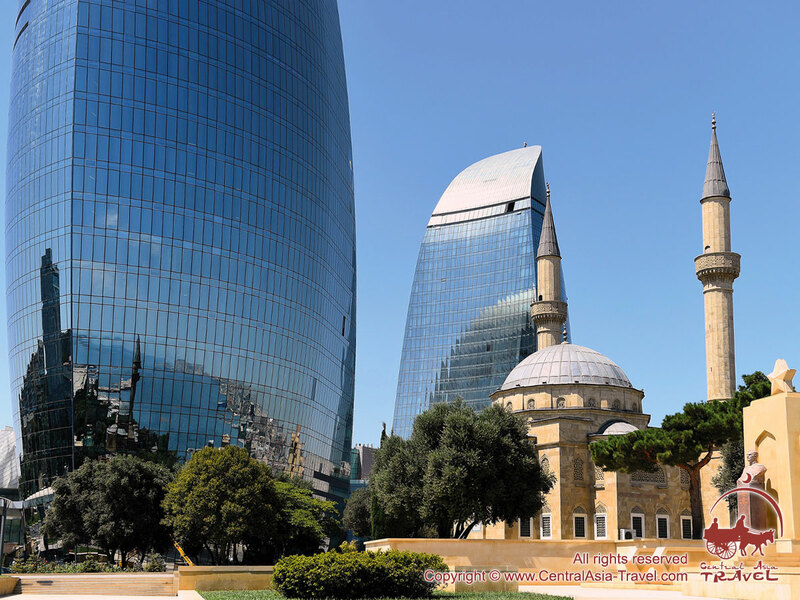 The area encompasses Azerbaijan’s National Assembly, the Martyrs’ Lane and the world-famous Flame Towers. The well-thought-out illumination system makes the park even more beautiful and spectacular in the nighttime. 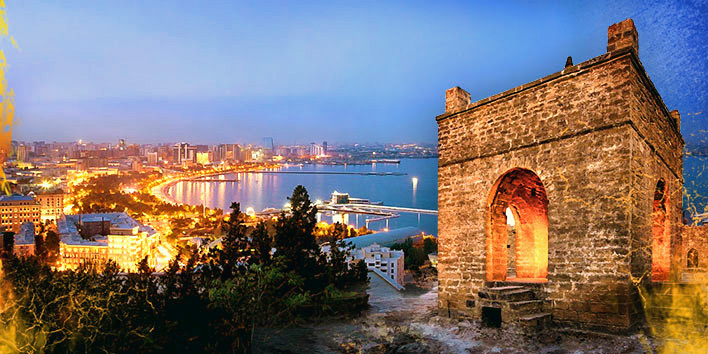 The excursion will go further to Baku Boulevard, which is one of the most remarkable spots in the city, favoured greatly by the locals and the guests of the capital. 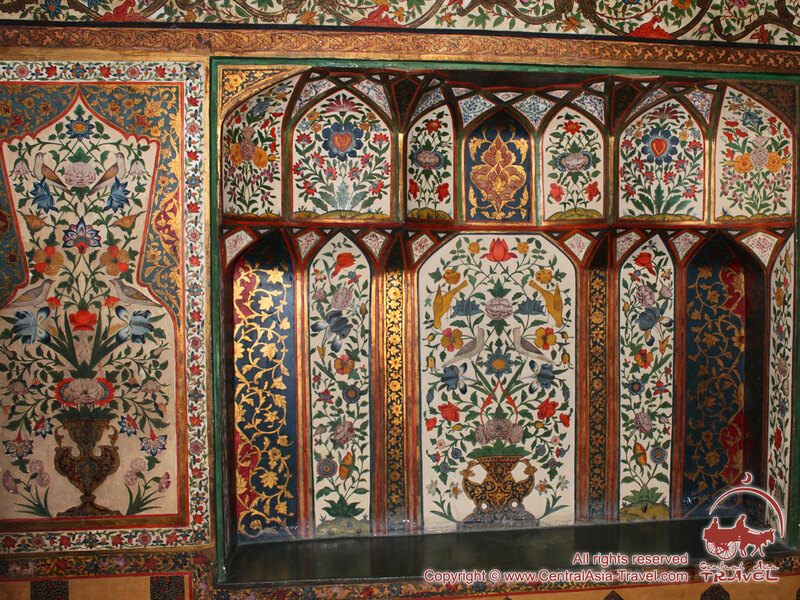 Decorated with flower beds and bushes of intricate shapes, it combines vast open areas closer to the sea and a shady alley. 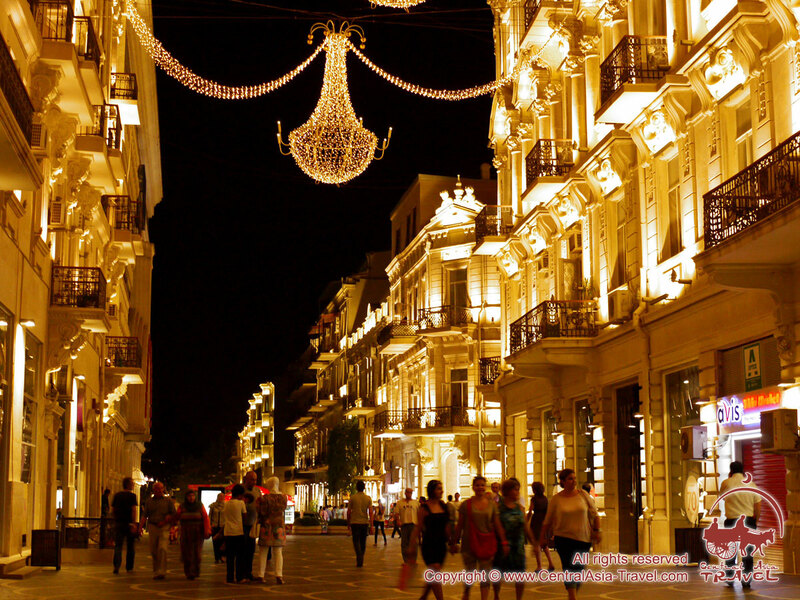 From the boulevard the tourists will follow down Nizami Street, a cosy, beautifully illuminated European-style mall. The street features a large number of shops and cafes, which attract a great number of people, particularly in the evening. The next in our evening programme is the Fountains Square. This is a wonderful place featuring a series of fountains with interesting designs and sculptures representing people awaiting their friends. Day 2. Baku. Sightseeing excursion. Breakfast at the hotel. The excursion to Baku starts from the central part of the city: the National Flag Square, new building of the Azerbaijan National Carpet and Arts Museum, Baku Boulevard, the building of the House of Government (former House of Council), Magomayev Philharmonic Hall, Mayoralty of Baku, the Governor’s Garden; it will continue in the Old City: the Palace of the Shirvanshahs (15th century), Maiden Tower (9th century), caravanserais, mosques and others; it will end at the Heydar Aliyev Centre, after which the tourists will return to the hotel. Overnight at the hotel. The excursion itinerary will cover the central part of the city and begin with a visit to the National Flag Square, which is the site of the main national flag of the Republic of Azerbaijan attached to the world’s second tallest flagpole (162 m). The majestic structure with a large flag flying in the wind is very spectacular and can be observed from different parts of the city. 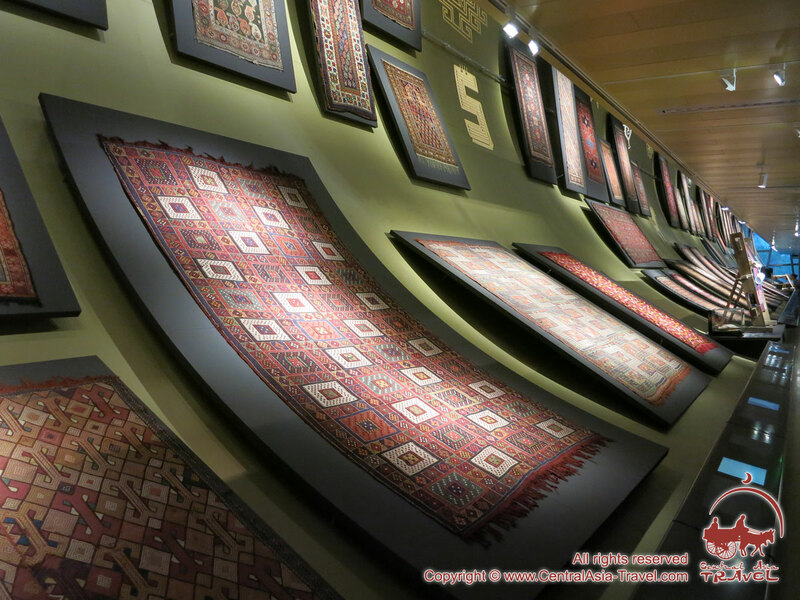 Our next stop will be at the Azerbaijan National Carpet and Arts Museum built in the form of a folded carpet and containing collections of carpets and other articles of the traditional Azerbaijani crafts, after which we shall have another stroll in Baku Boulevard, this time illuminated with natural light. 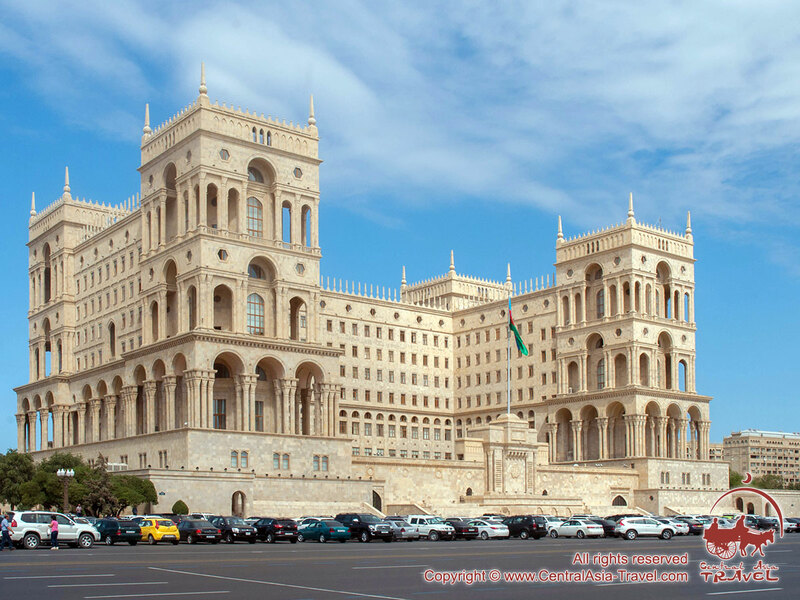 Then the guests will proceed to the House of the Government of the Republic of Azerbaijan, a building in the baroque style, the Magomayev Philharmonic Hall, an important architectural monument, and the Mayoralty of Baku. Further the tourists will visit the Governor’s Garden, the oldest garden of Baku, organised on the site of former private orchards and gardens in the 1930s and occupying a territory of 4.5 ha. 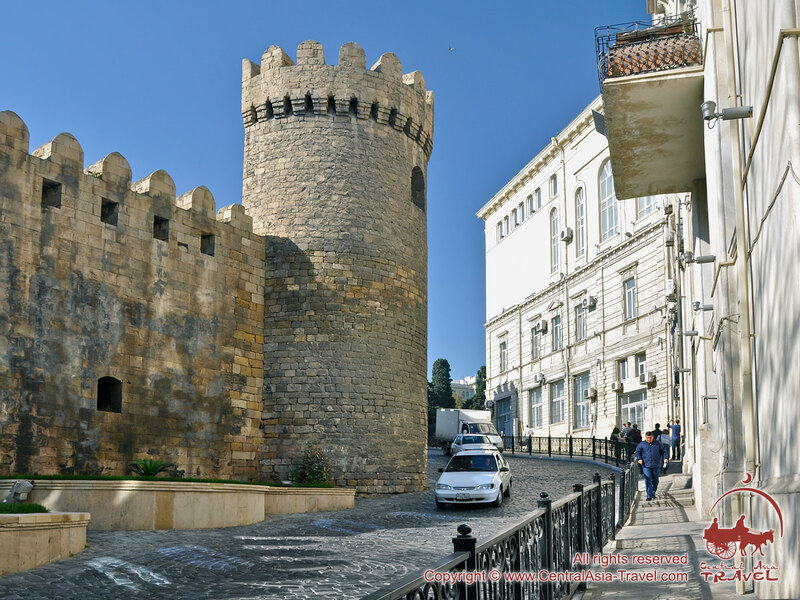 Our trip will continue in the Old City featuring narrow cobbled lanes and old fortress walls. This area is famous among the people of the former USSR, as a number of popular Soviet films, such as The Diamond Arm, Teheran 43, The Amphibian Man, Aibolit 66 and others, were shot in the streets of the Old City. 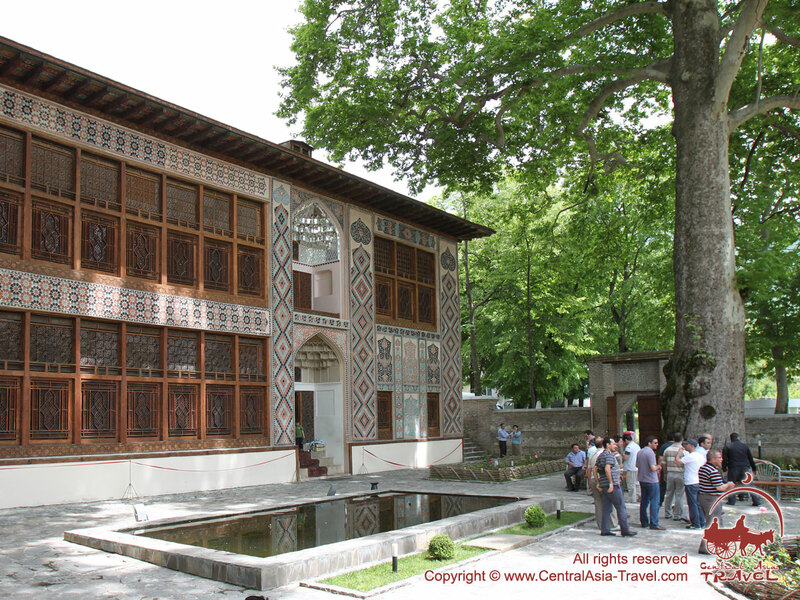 The most significant monuments of the Old City, also named Icheri Shekher, are the Maiden Tower (9th century) and the Palace of the Shirvanshahs (15th century), the latter known as the pearl of the Azerbaijani architecture. 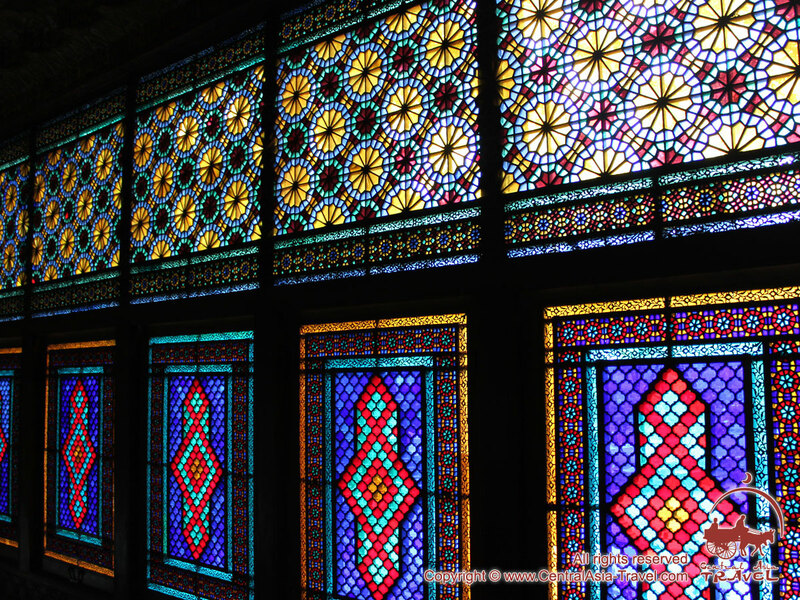 The Old City contains a large number of historical monuments - mosques, bathhouses, caravanserais and ordinary houses. 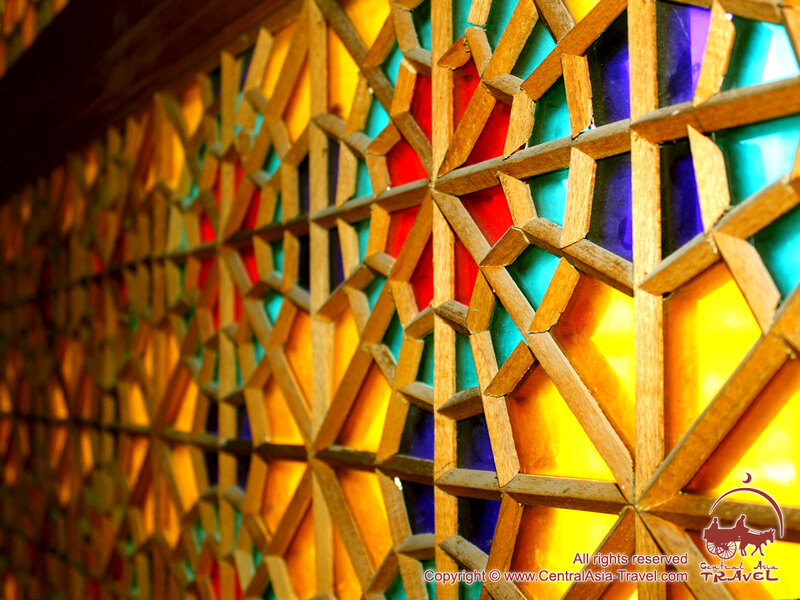 There also are several museums, embassies and hotels in the territory of the Old City. 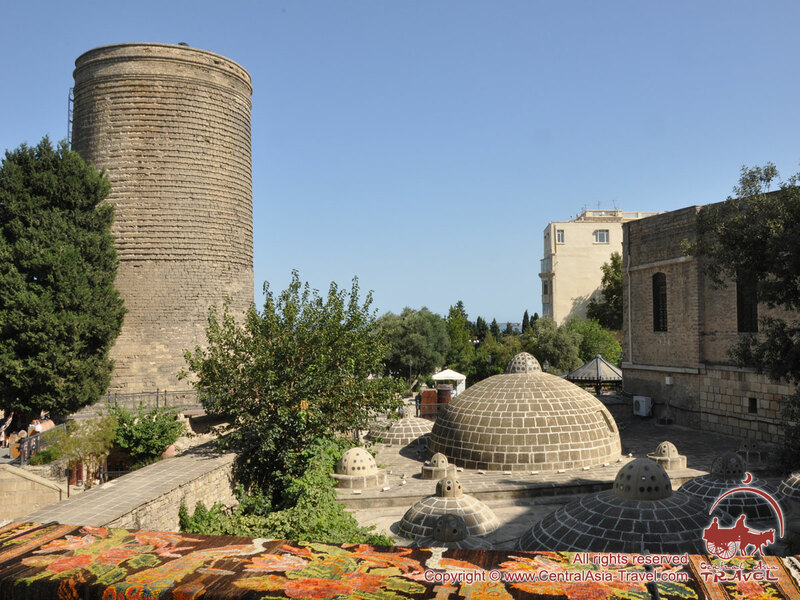 Icheri Sshekher became the first Azerbaijani object included in UNESCO’s World Heritage List. 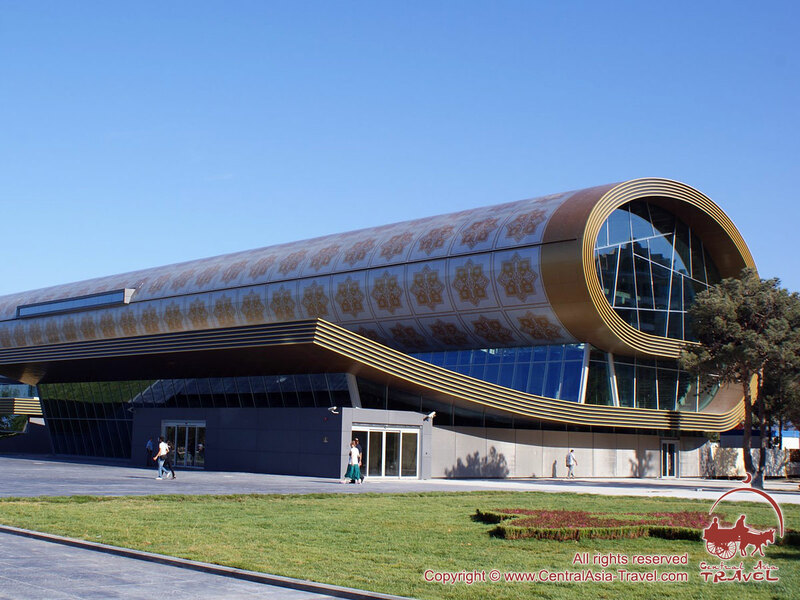 The excursion will end at the Heydar Aliyev Centre named in honour of the 3rd President of Azerbaijan. 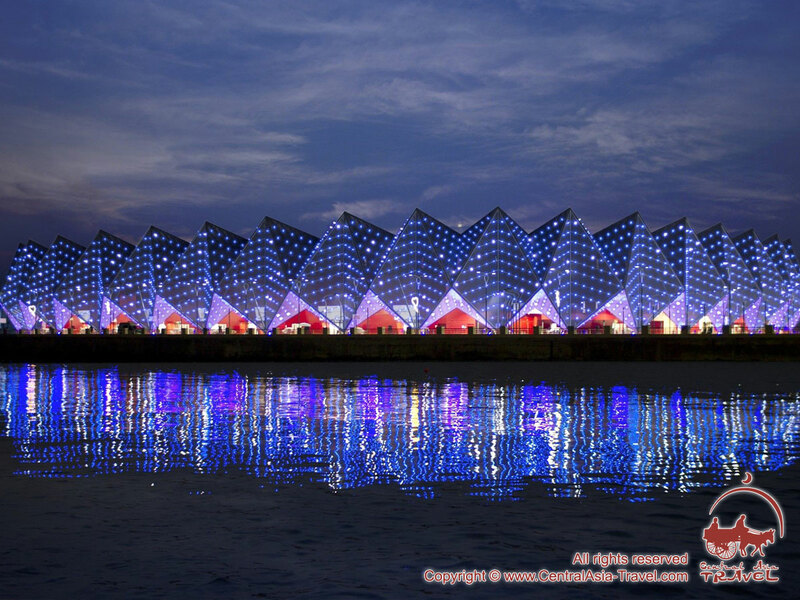 This is one of the most remarkable and unusual constructions not only in Azerbaijan, but also throughout the Caucasus. In 2014 it was named the best construction of the world, and its architect, Briton Zaha Khadid, was awarded ‘the best designer of the year.’ The Centre includes museums, an exhibition complex, a concert hall, a library and halls for holding important events. The Centre building is characterised by undulating forms with no right angles and very few straight lines, which, according to the author, symbolises eternity. Day 3. Baku - the Apsheron Peninsula - Baku. Breakfast at the hotel. 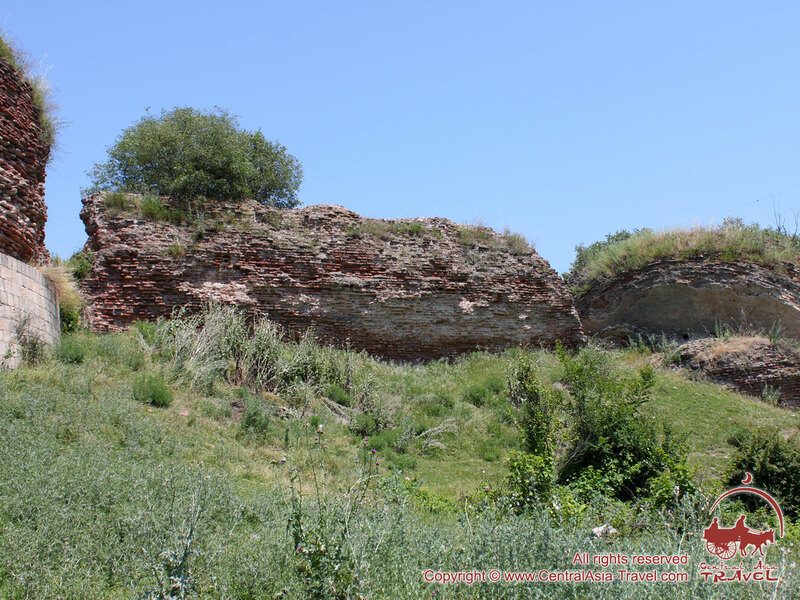 Excursion to the villages of Surakhany and Mehemmedli and Yanar Dag Hill. Return to hotel. Overnight at the hotel. Our acquaintance with Azerbaijan and the Apsheron Peninsula will continue in the village of Surakhany, where we shall visit a Zoroastrian temple. 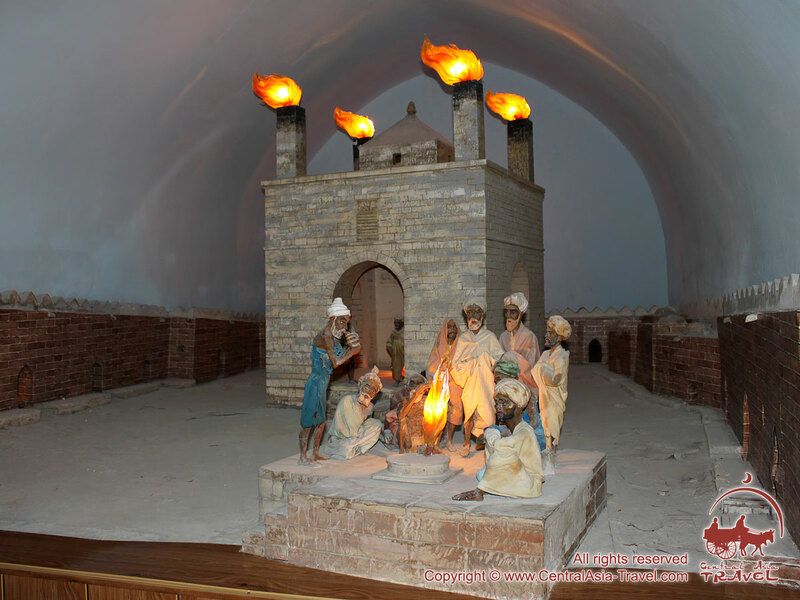 Elements of the fire cult and Zoroastrianism can still be found in Azerbaijan today, as the latter was a predominant religion in the region for thousands of years. This is confirmed by the country’s name proper, which, according to one of the versions, translates from ancient Persian as ‘the land of the eternal fire.’ Nowadays Zoroastrian traditions are still held in high esteem. One of the examples is Nowruz (Navruz, Novruz) - the holiday associated with Zoroastrianism, which is the main holiday of modern Azerbaijan. Fire worshippers from all over the world were always attracted by these areas reserving rich oil and gas deposits. There is a monument, the Ateshgahtemple, that has remained in the territory since those times. The monument’s name translates as ‘a fire site,’ which relates to ever-burning natural gas coming out from under the ground. 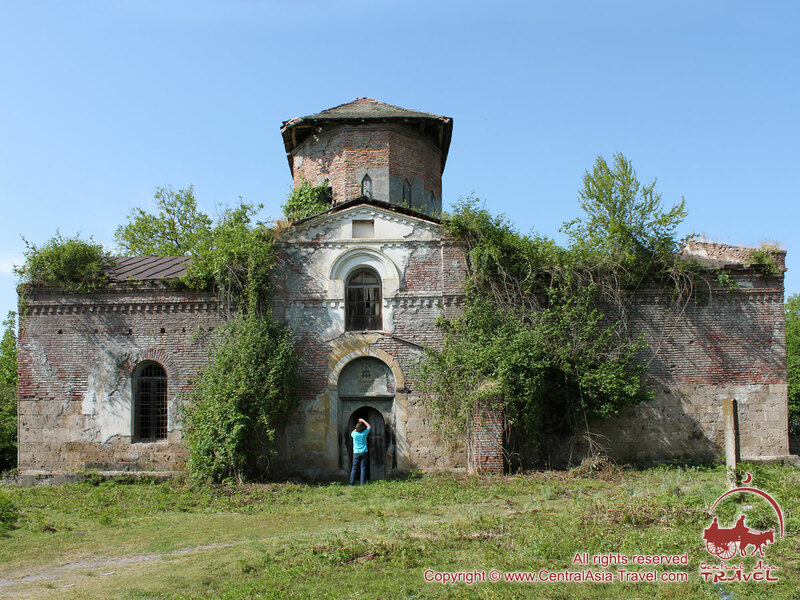 In former times the peninsula had a great number of places like this one, which decreased considerably with the development of oil and gas industry. After that we shall move to the village of Mehemmedli situated at the foot of the Yanar Dag Hill (the hill’s name translating as ‘the burning mountain’). 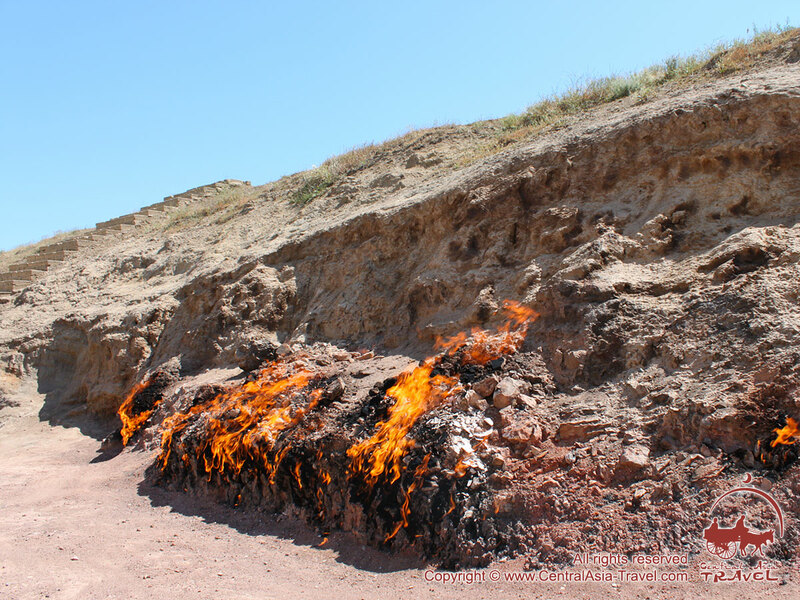 Today the Yanar Dag Hill is the only place on the Apsheron Peninsula where one can see columns of burning gas. Day 4. 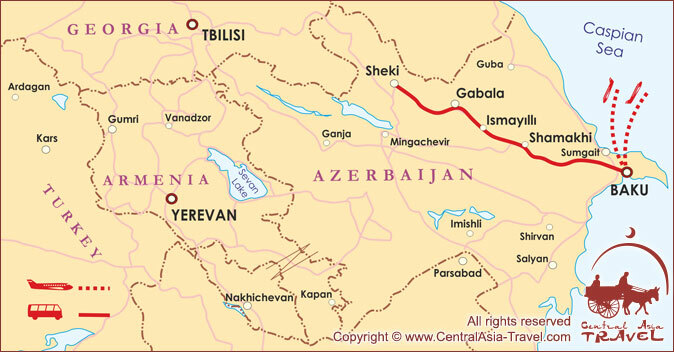 Baku - Shamakhi - Gabala - Sheki. Breakfast at the hotel. Departure from hotel. Early departure from Baku. 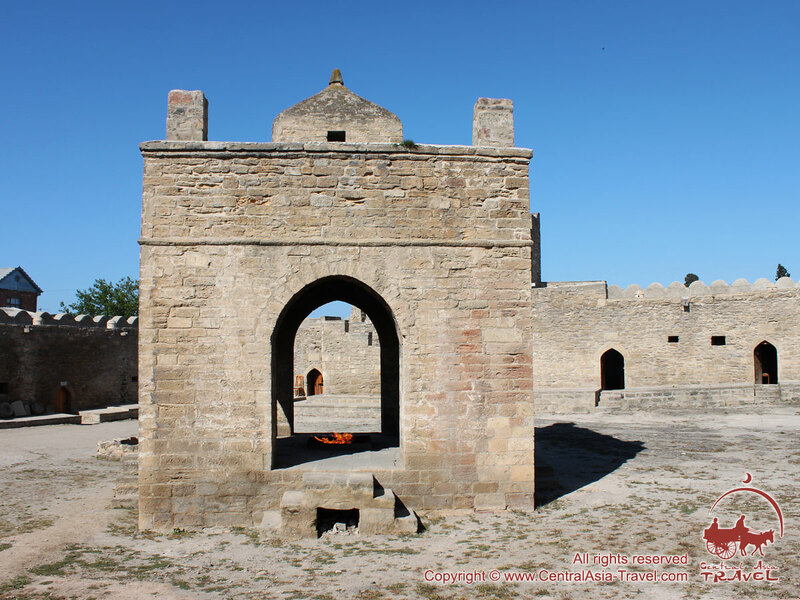 Excursion to the town of Shamakhi: the Juma Mosque (19th century) and Yeddi Gumbez Mausoleum. Trip to Lake Nohur. 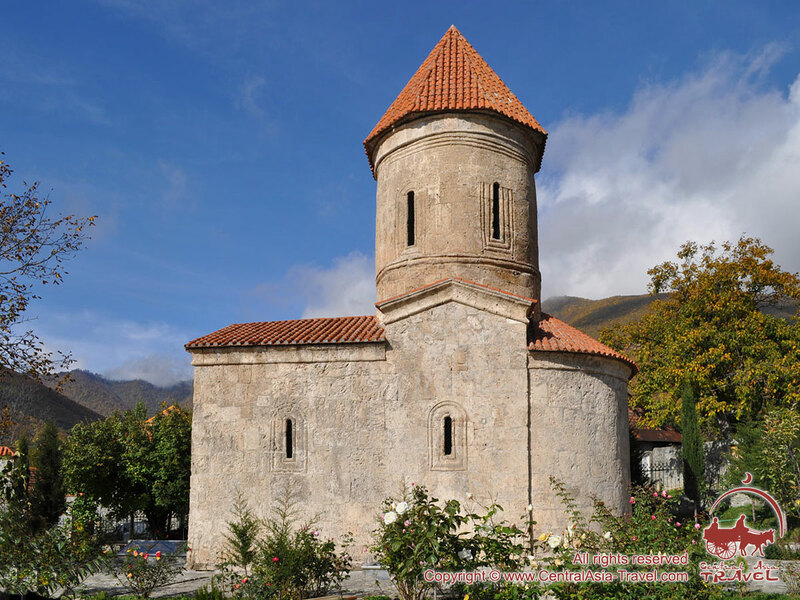 Excursion to the town of Chukhur Gabala. Familiarisation with the village of Nij. 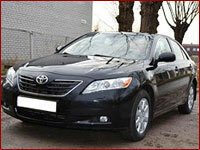 Transfer to Sheki and accommodation in hotel. Lunch and free time for rest. Return to hotel. Overnight at the hotel. From Baku we shall make for the city of Shamakhi (you may remember the queen of Shamakhi from one of Pushkin’s poems), which was once a key point on the Great Silk Road (Route). 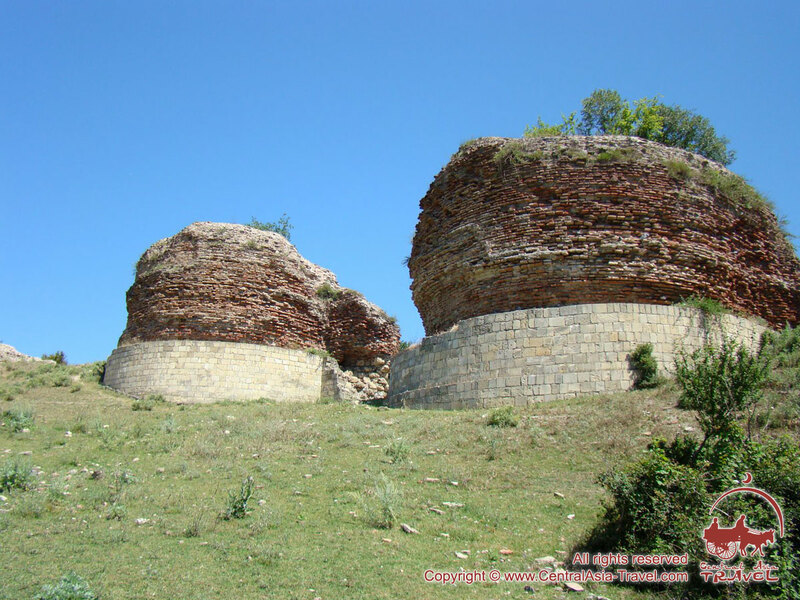 Shamakhi is an ancient city, which sprang up in the 5th century, and a place where the famous historical and architectural monuments, the Juma Mosque and Yeddi Gumbez Mausoleum, were built. The city often becomes the site of people’s holidays, with impromptu mini concerts, holiday bazaars and traditional sports events organised in its streets. 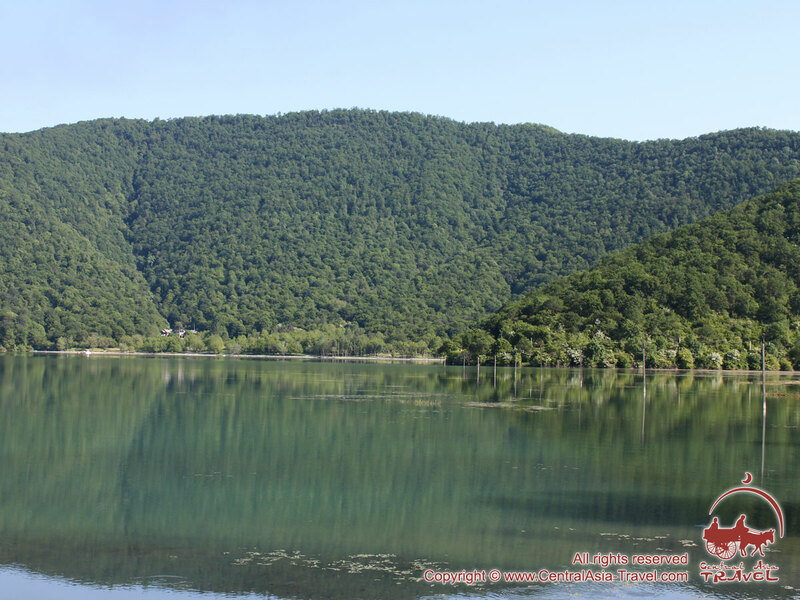 The next point on our itinerary is Nohur, a beautiful lake famous for its crystal clear, turquoise water and a profusion of fish. 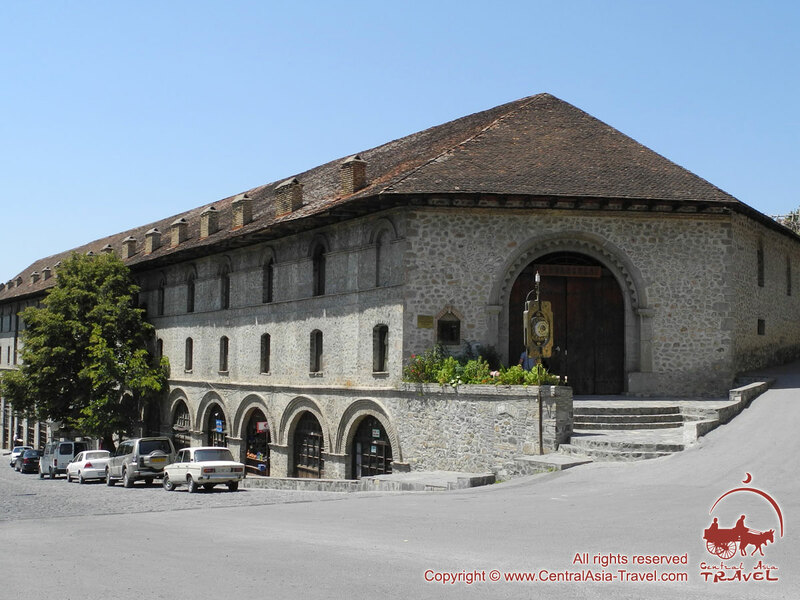 We shall then go to Chukhur Gabala, the site of the ancient city of Kabala, which was the capital of an antique country in Caucasian Albania with the rulers’ palace in its central part and which became the country’s religious centre after Christianity had been established in the region. 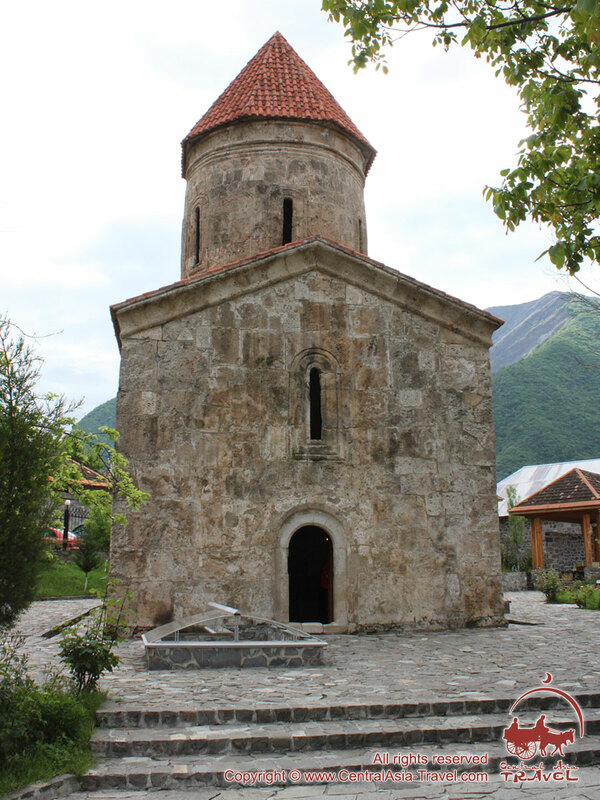 Further we shall move to the village of Nij inhabited by the Udis, the most ancient aboriginal people of the Eastern Caucasus. About 10 thousand representatives of this people live around the world, with approximately 4 thousand Udis living in Gabala District. 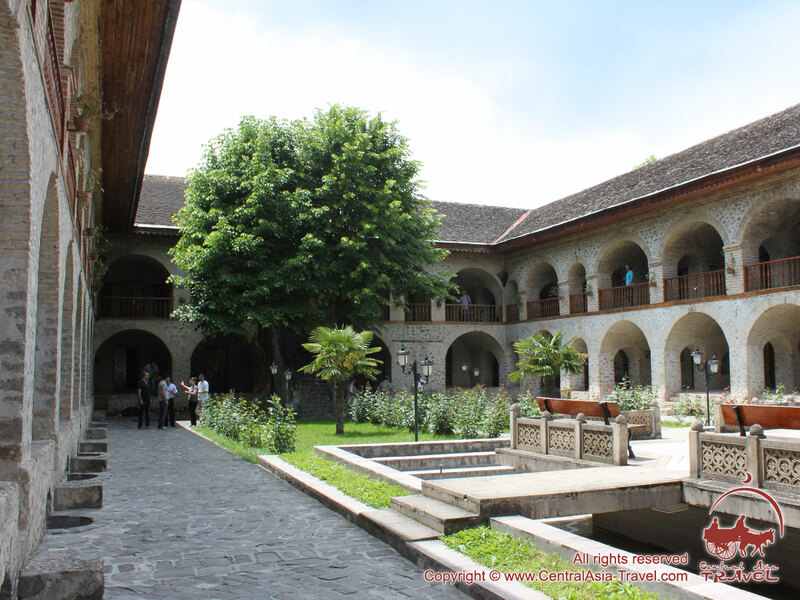 Our excursion will end in Sheki, where we shall have a lunch and some rest. Day 5. 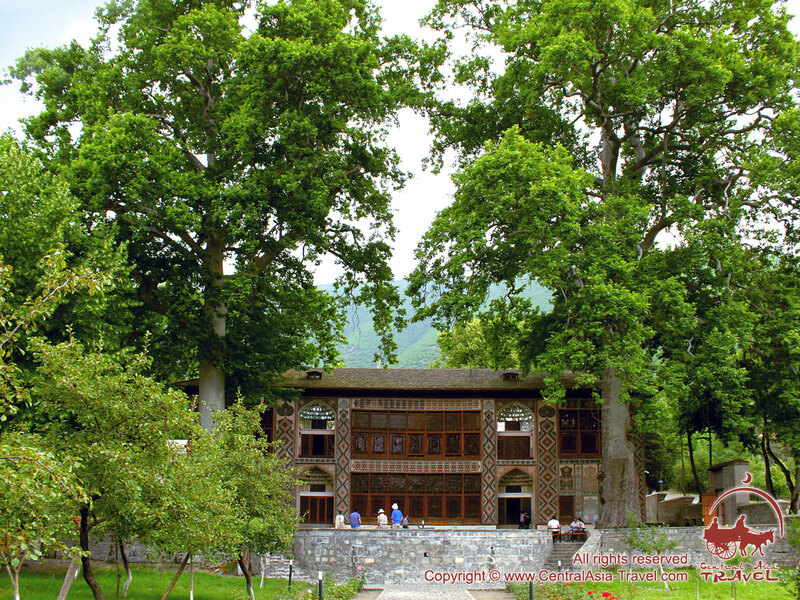 Sheki - Kish - Sheki. Breakfast at the hotel. 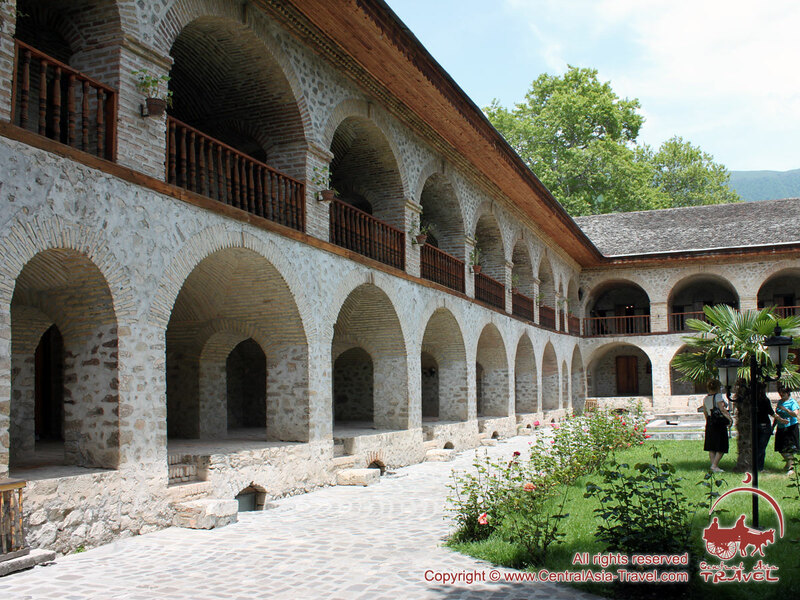 Excursion to Sheki: the Khan’s Summer Palace, shebeke production shop, Sheki pakhlava (oriental cakes with the walnut filling) production shop, the Albanian church in the village of Kish. Return to hotel. Overnight at the hotel. 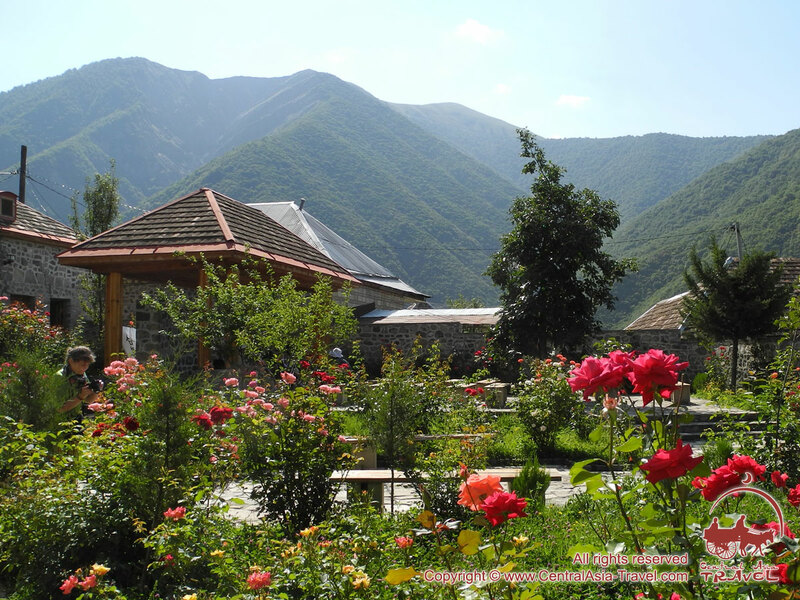 The town of Sheki located in a picturesque mountain region featuring beautiful valleys, deep gorges, crystal clear springs and dense forests is considered one of the most ancient and popular settlements of Azerbaijan. 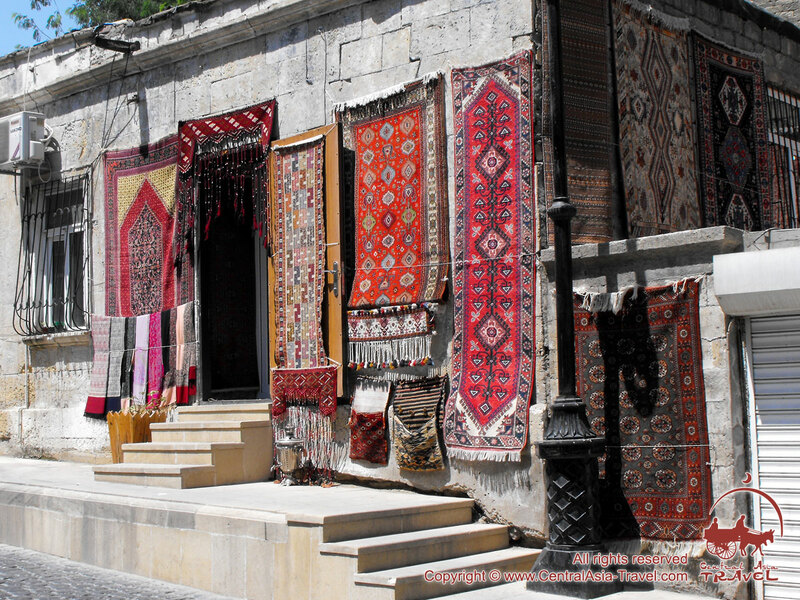 In the old times Sheki was a silk production centre and an important point on the Great Silk Road. Now the town is a major craft centre where one can purchase jewels and engraved articles of local manufacture. 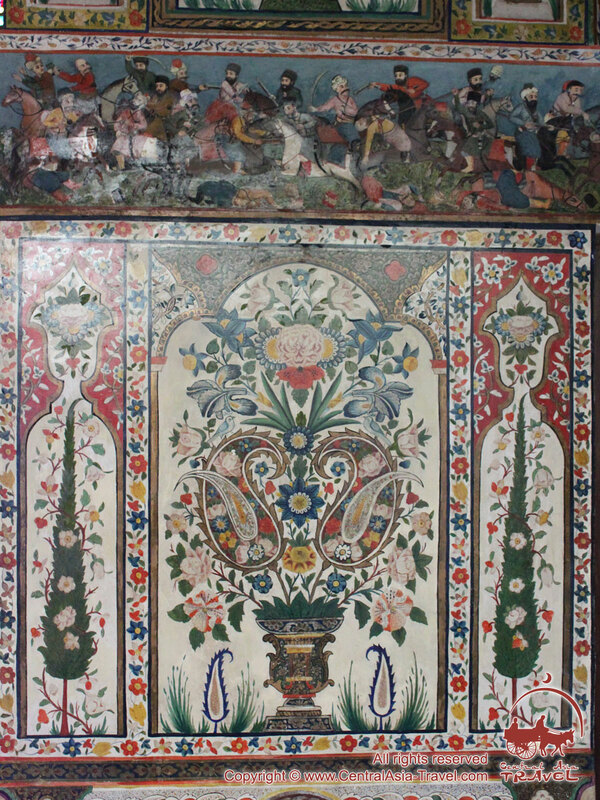 The excursion to the town will begin from the Khan’s Summer Palace decorated with fine frescoes. 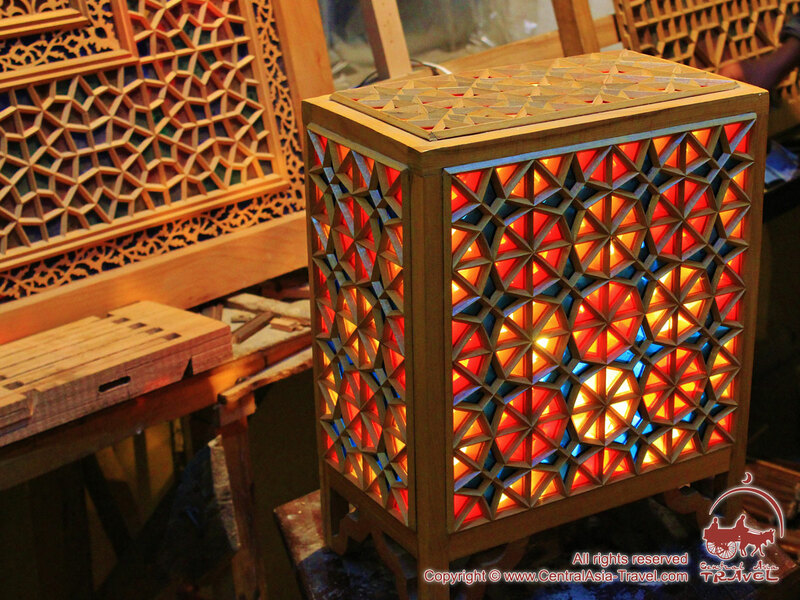 Later this day we shall visit a shop, where we shall learn the secrets of the production of shebeke - windows with frames made of small wooden parts, assembled without the use of either glue or nails and filled with coloured panes. After that we shall go to another shop - that producing ‘Sheki pakhlava’ popular throughout Azerbaijan. 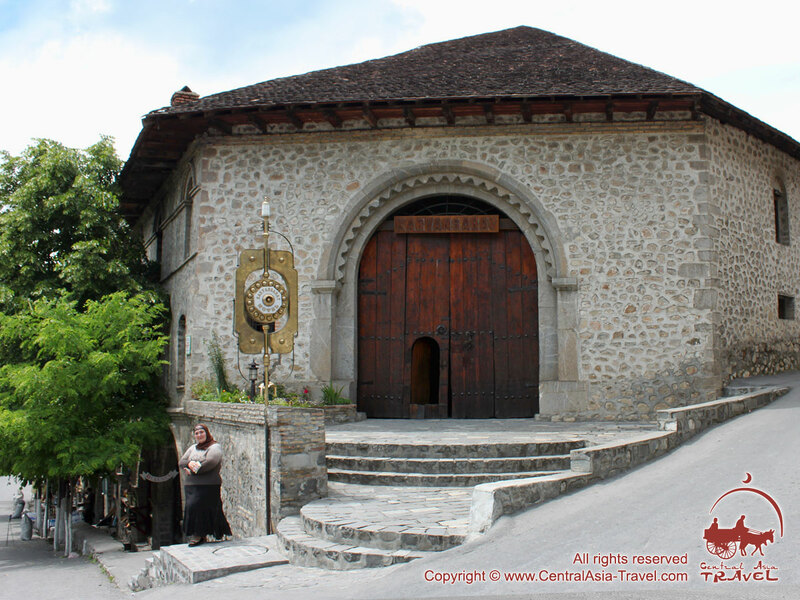 The next place we are going to is the Albanian Church in the village of Kish. 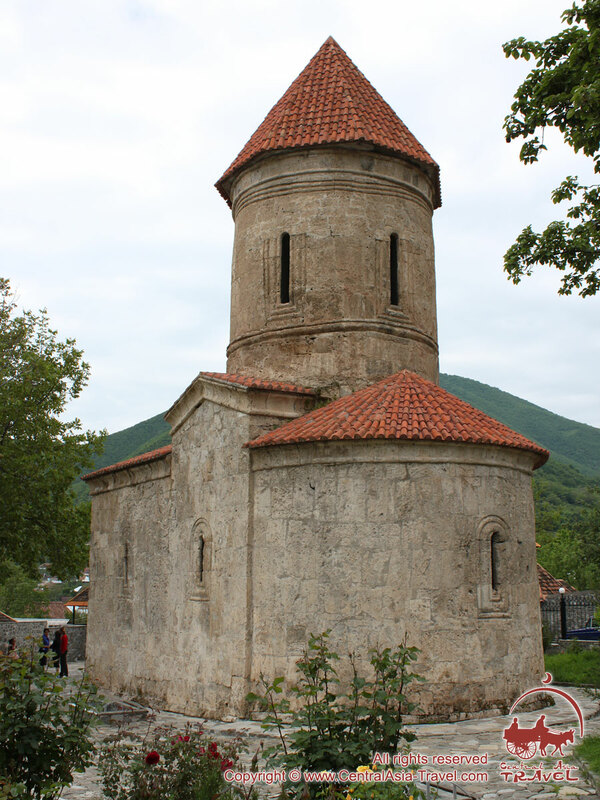 According to one of the versions, this was the first Christian church in the whole of Transcaucasia. In addition, this is a place where scientists discovered remains of people strikingly different from those inhabiting the territory nowadays, the found skeletons being those of blond-haired blue-eyed tall people. Norwegian researcher Thor Heyerdahl visited the area and made a hypothesis that these people were the ancestors of the Vikings, who later migrated to the north. In 2003 the Norwegian Government financed the restoration of the church, which was initiated by Thor Heyerdahl. Return to Sheki. Overnight at the hotel. Day 6. 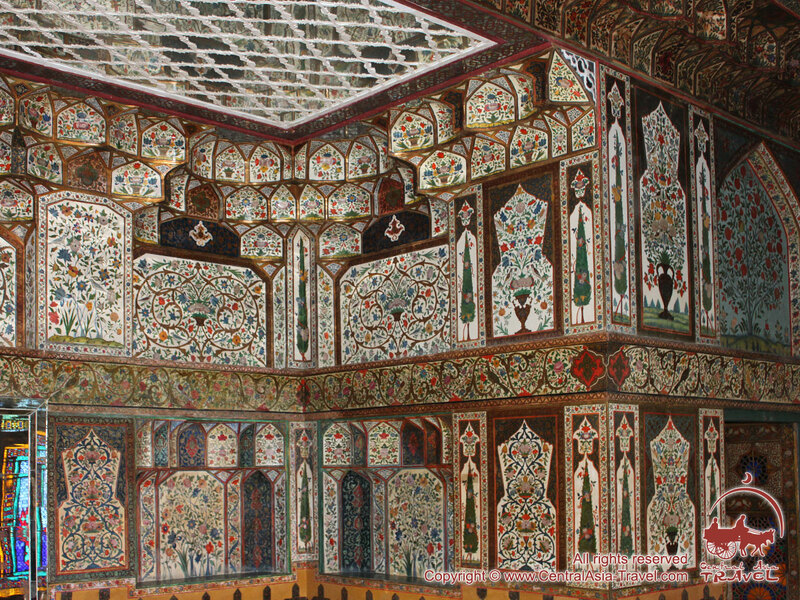 Sheki - Baku. Breakfast at the hotel. Departure from hotel. Departure from Sheki. Arrival in Baku. Accommodation in hotel. Overnight at the hotel. Transfer from Sheki to Baku. Night at hotel in Baku. Day 7. Baku - Gobustan National Park - Baku. Breakfast at the hotel. Excursion to the Gobustan National Park. Return to hotel. Overnight at the hotel. 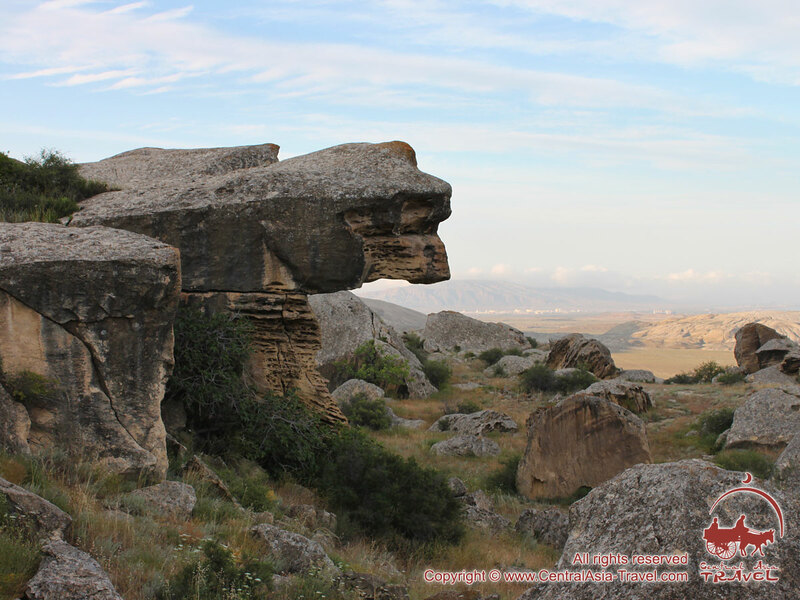 The Gobustan National Park lies 30 km south of Baku, connected with the latter via a high-quality road, which makes the park quite easy to reach. 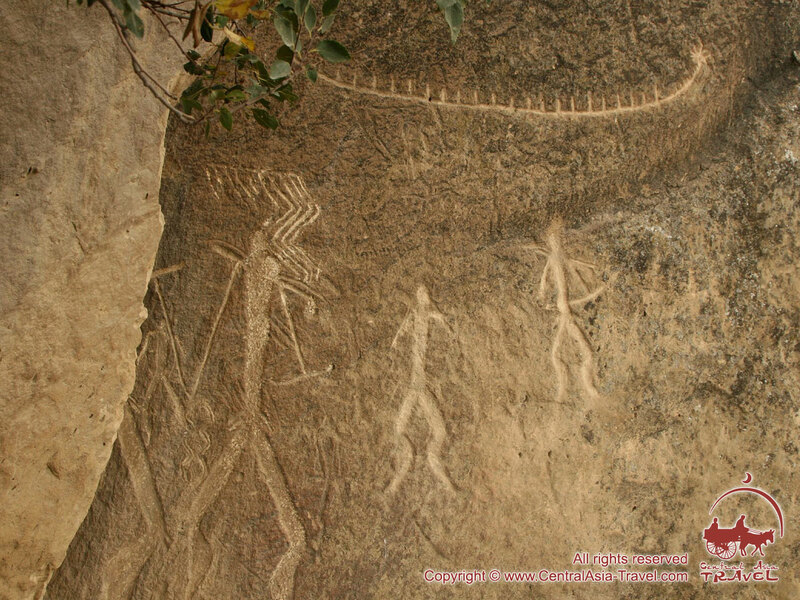 The monuments of Gobustan include rock paintings and archaeological sites among other interesting objects. The rock paintings are arranged quite compactly and number several thousand, their age ranging from 4 to 5 thousand years old. 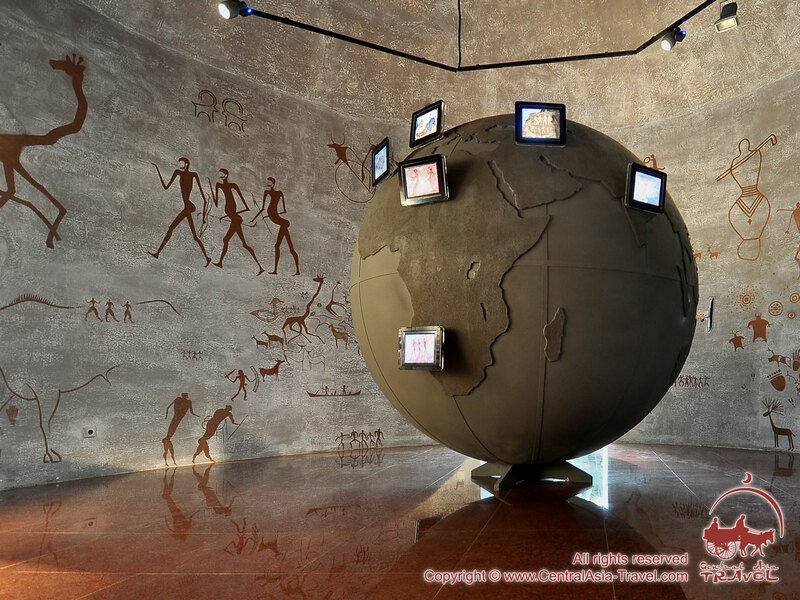 Prior to the excursion to Gobustan we shall visit an interactive museum, where we can learn about the nature of Gobustan using multimedia programmes and touch screens. 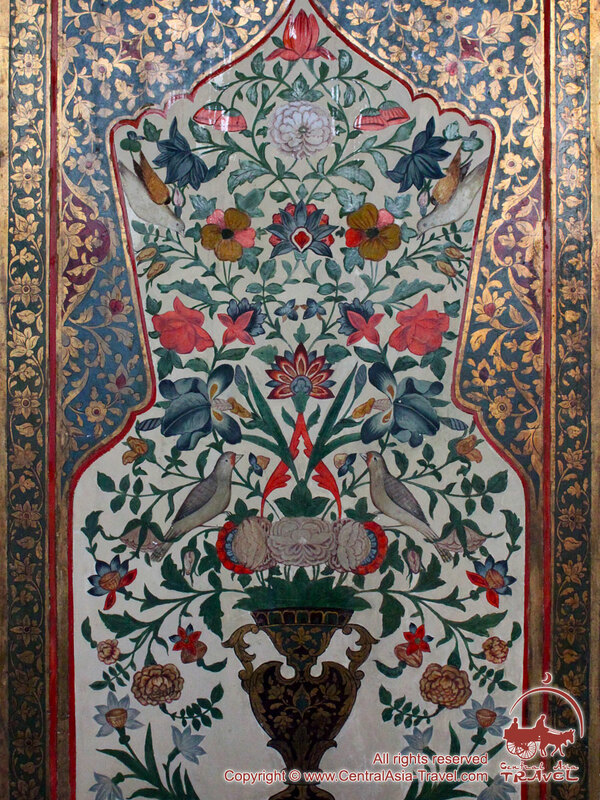 Almost every room at the museum features an interactive panel, where one can learn about the room’s objects. The museum also has a stereo 3D projector to let us experience a virtual flight over Gobustan and its neighbourhood. 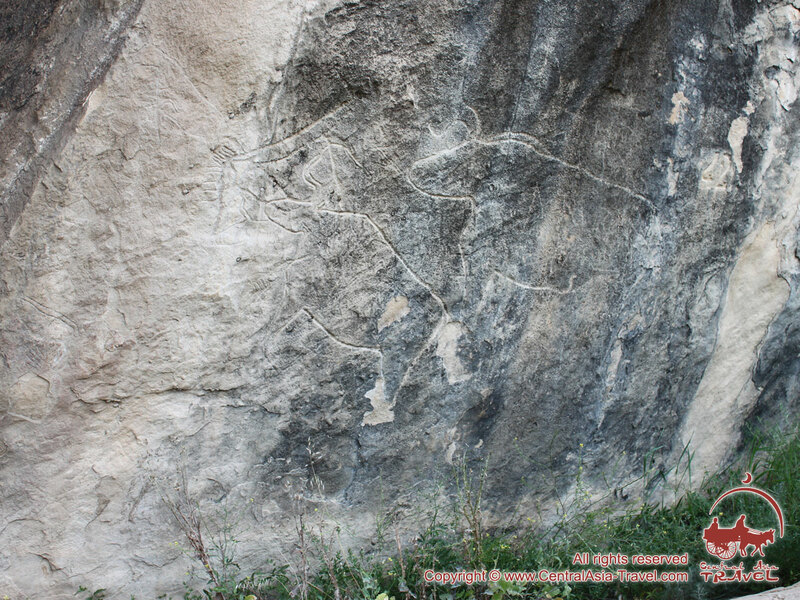 The most remarkable, however, is the site of the petroglyphs on a mountain slope 1.5 km from the museum. The collection consists of about 6,000 rock paintings made during a vast period of time, from the Mesolithic to the Middle Ages. 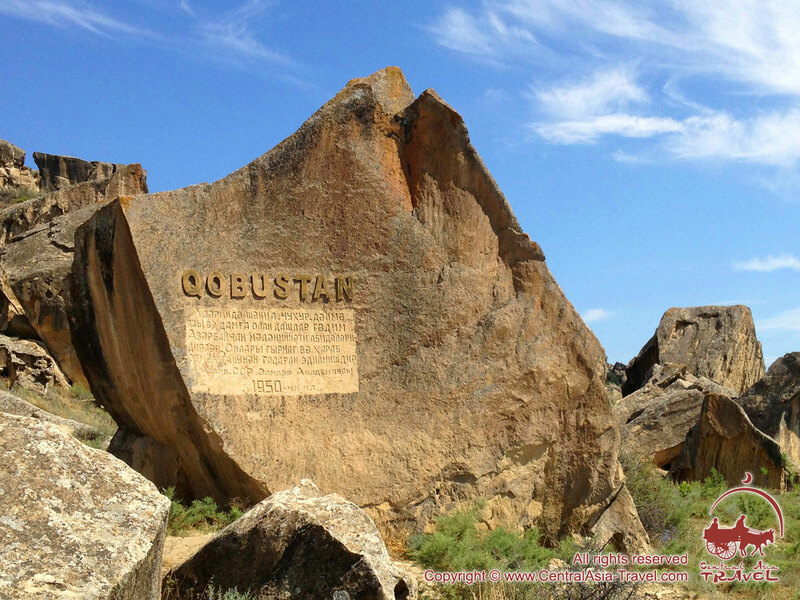 Another interesting feature about Gobustan is its desert landscapes contrasting with the classical Caucasian sceneries. Gobustan nearness to a large city makes its objects all the more attractive. Breakfast at hotel. Departure from hotel (before 12.00 a.m.). Departure from Baku. So, today is the final day of our trip. During the past week you have acquainted yourselves with the main places of interest in Azerbaijan, which actually has a great number of them, with over 30 monuments included in the UNESCO Cultural Heritage List. 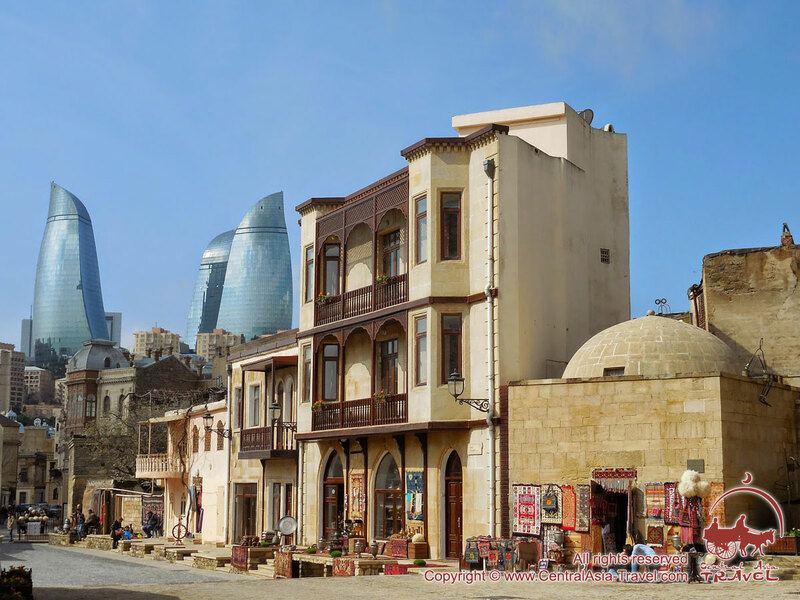 In this tour we attempted to reveal Azerbaijan’s diverse contrasting aspects. We hope that you have had a wonderful time of it in Azerbaijan and have acquired a lot of positive emotion and useful knowledge! We are looking forward to meeting you on other trips! Good luck! Supplement for dinners - 25 USD/per person/per dinner. What nationals need visas to enter Azerbaijan? 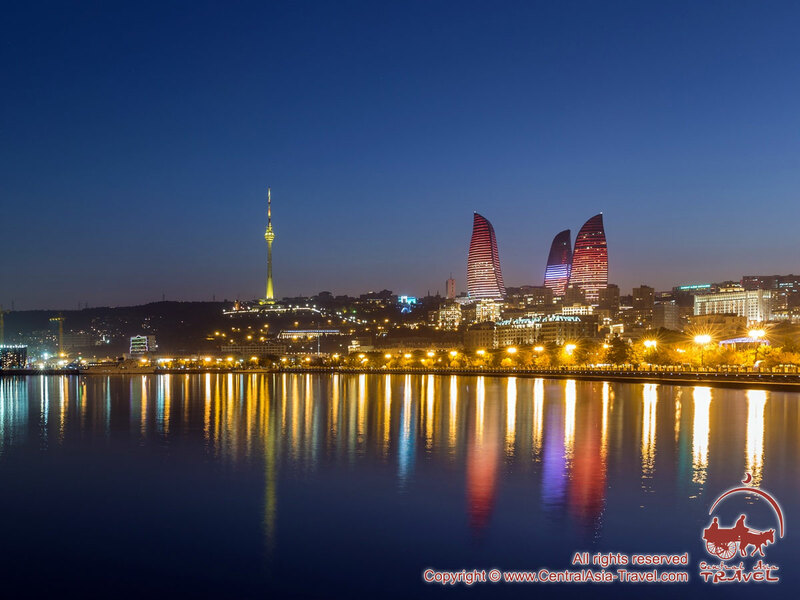 Here you can obtain all necessary information on the visa for Azerbaijan. To enter the country you are to have an international passport. Is it necessary to get a stay permit (temporary registration of stay) while visiting Azerbaijan? All foreigners who plan to stay in Azerbaijan for over 10 days must register at the State Migration Service of Azerbaijan within 10 days from their arrival date. Hotels usually help their guests carry out this procedure; however, tourists living in private homes or unlicensed hotels are to register on their own. The registration is absolutely free, but the failure to register may lead to a fine equal to 300-400 Azerbaijani manat. What is Azerbaijan’s currency? Where can I exchange money? Can I use credit cards in Azerbaijan? Credit cards Master Card and Visa can be used at boutiques, expensive restaurants and large hotels. Credit cards may be rejected by some food shops, cafes, hotels or boarding houses. You can hardly use credit cards outside cities. What is the difference between GMT and Azerbaijan time? The local time in Azerbaijan is +4 GMT. Can foreigners to Azerbaijan use the services of a local mobile network operator during their stays in the country? 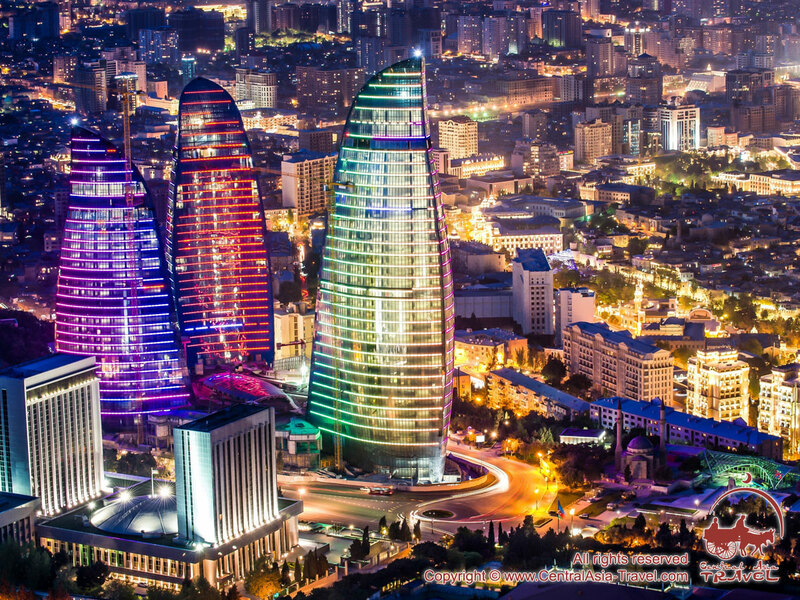 Foreigners can use any of the local Azerbaijani mobile network operators (Azercell, Bakcell, NarMobile), for which you are to show your passport and tell the address you are living at in Azerbaijan. Can I bring alcoholic beverages into Azerbaijan? People are allowed to bring up to 1.5 litres of strong alcoholic drinks and up to 2 litres of wine (for persons over 16 years of age) to Azerbaijan. What maximum amount of cash can I bring into Azerbaijan? You are allowed to bring any amount of foreign currency to Azerbaijan, on condition that you indicate the sum in your customs declaration. In case you have with you less than 1,000 US dollars or a sum in any other currency smaller than 1,000 US dollars, you need not indicate it in your customs declaration. What maximum amount of cash can I take out of Azerbaijan? The sum of money that foreigners are allowed to take out of Azerbaijan must not exceed the sum they brought to the country in accordance with the customs declaration. Photography is allowed at any monument, unless there is a sign prohibiting it. Additional fee may be imposed for photographing. Among objects that may not be photographed are the underground (subway, metro), airports, bus stations, oil-processing plants and factories and other guarded objects. What kind of clothes should I wear in Azerbaijan? Are there any clothing requirements for women in the country? If you travel in the period since May to September, you are to have with you light summer clothes, while in winter you should remember to take with you warm coats or jackets. In summer it is strongly recommended that you put on a headwear and use sunscreen. The weather in Azerbaijan is variable and unstable; northern and mountain regions may feature cool days even in hot seasons, which is why it is advisable to have some warm clothes. The footwear must be comfortable; you should wear trainers (sneakers) when in a rough terrain. There are no restrictions as to women’s clothes. However, in cultic and religious places women should cover the head with a scarf or shawl. What languages do people in Azerbaijan speak? The country’s official language is Azerbaijani. Russian and English are also important languages widely used in education and communication.